Recently someone posted, on Facebook, the video I have included at the bottom of this post. It is of Halla, a famous jumping mare whose rider was seriously injured at the Stockholm Olympics – yet she carried him around a clear round to win gold! Revisiting Halla’s story, and watching that ride, brought back memories of a ride where I too was injured, and relied on a special horse to get me through. Although not on the scale of what Halla and Hans accomplished, it is yet a powerful memory, and a personal lesson in how amazing horses really are. 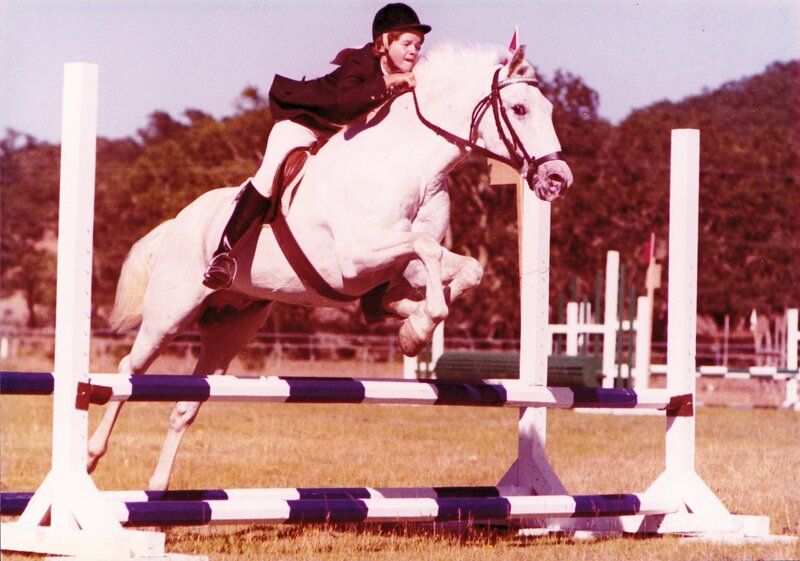 The horse in question was Wicki, my first Appaloosa. We had been together just over a year, and we were competing in our fourth three-day event. The third jump on cross-country was a double down-bank. The space between the two banks was a hard packed fire road. For some reason, Wicki stumbled between the two banks. He went down on both knees, and I sailed over his head. I landed on the hard road face first. In a vain attempt to save my face, I put my right hand out – and bent my middle finger backwards. Wicki was shaken, dirt on his face, and I was still down. Well meaning bystanders tried to catch Wicki – but he kept avoiding them and circling back to me. As I struggled to catch my breath, I waved them away. I was worried that he’d bolt if they persisted. They backed up and Wicki came right up to me. Someone offered to help me back to the start – but I dazedly insisted on getting a leg up. Still shaking, I circled Wicki back and did the double bank again. I cannot recall much about that course. My face and head were throbbing, my right hand could do no more than just keep the rein from falling. I do remember, vividly, one particular sequence of fences – a path weaving through a forest up a hill, right turn to a log wall, then to a steep gully – straight down, jump at the bottom, then straight up. Wicki was a powerful and fast little cross-country machine. I had learned by now to stay out of his way, and only ask when I needed him to really listen. This combination worried me on the walk – and that’s when I was planning on being fully able bodied! As we headed up through the trees, I began to talk to Wicki. I was rapidly weakening, and my voice was the only reliable tool I had. I talked all the way through the trees – “Now slow down. Turn right. Slow. Steady. There it is. Good boy.” I could hear the folks around the fence laughing at the dialog, as they had no way of knowing how close I was to coming off again! Now to the gully. I was by now terrified of this jump, but had no thought of quitting. “Please slow down Wicki. Please!” As we reached the crest, my usually bold little fellow slowed to a walk. He then carefully jogged down the steep grade, gently hopped the fence, then carefully jogged up the hill. At the top, he stopped and waited until I signaled that I was ready to go on. My only picture from that event, our stadium ride the next day. Two more fences were all that was left! The entire rest of the course I was blabbering at him about what a wonderful, special boy he was! I wish I had the picture of the last fence to show you. We should have bought it – but I was too embarrassed! In it I was literally hanging off the side of his neck, one arm hooked over it, my heels up to his flanks. I would not have stayed on much longer! Wicki crossed the finish line and trotted right up to one of our friends. I slid off and almost fainted, but managed a huge hug of my boy’s neck before being escorted to the first aid truck. My injuries weren’t very serious, so I rode stadium the next day with a splinted finger – although it was against doctors recommendations. But no one ever said riders are sane! As I said, it was no Grand Prix jumping course for Olympic gold – but for that teenage girl it might as well have been! Who wouldn’t treasure having your horse take care of you at a moment of great need? What better measure of your relationship?! So, with that, please enjoy this video of Halla and her historic moment – still remembered with admiration by riders the world over! Be good to your horses… and may they be good to you! This entry was posted in My Journey and tagged cross-country, Halla, Hans Gunther-Winkler, heroic horses, jumping, memories, relationships, riding injured, Stockholm Olympics, vintage video, Wicki. Bookmark the permalink. 2 Responses to Horses are amazing! Agree! It’s very clear that he is just able to hang on. Even more amazing that she was considered unworkable before he got her!